Notes: An original production from Lay-duce; a manga adaptation began serializing almost simultaneously in June 2015 and runs in Monthly Comic Alive as of late 2015. Several related light novels have also been published. 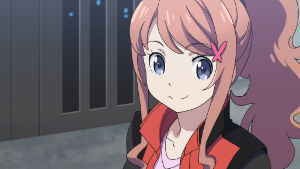 The official Japanese title includes a star between the two words; it isn’t possible to produce this character in the fields this site uses, and it’s therefore left out here. In the future, interplanetary space travel has been developed, and an aerospace corporation headed by the Kirishina family has opened an academy on Mars. One specialized class from this academy, Advanced Technological Development Department, Educational Development Class or "A-TEC," consists of especially gifted students who devote a significant chunk of their time to the design and building of rocket engines. 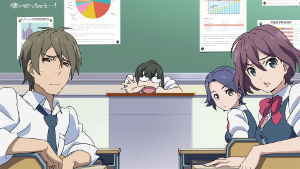 Some within the management of the Kirishina Corp. are unconvinced that this class is economical, however, leading to a clash between the ambitious young homeroom teacher of A-TEC and older brother of one of the students, Kaitou Sera, and Nagisa Kiryuu, a supposed "transfer student" who is none-too-secretly a representative of the board, and not exactly approving of Kaitou's work, nor that of the students' labor union. Explicitly political anime are rare, and realistic depictions of Japan's current political system in anime are even harder to find; I could probably count the ones I'm familiar with on one, maybe two hands. Whether this has to do with the escapist tendencies of anime and manga, the desires of editors or committee chairmen, general political apathy, or simply the near-complete dominance of the ironically named Liberal Democratic Party over national politics since World War II, appearances of the nation's politicians, whether real or fictitious, tend to be brief and non-controversial, a few satirical examples like Sayonara Zetsubou Sensei notwithstanding. That's not to say that anime isn't or can't be "political," but rather that you're far more likely to find a series centered around, say, a guy who fights aliens with his nose hair than you are a political drama. To that end, 2015's Classroom Crisis sticks out for its subject matter alone, being a nominal science-fiction series whose primary drama, at least initially, stems from labor disputes and related electoral politics. 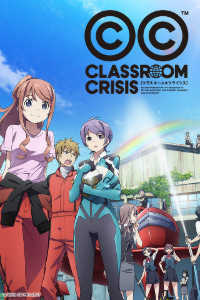 That might not be a completely accurate description, since it makes Classroom Crisis look at least somewhat more heavy-handed than it is, but even if the political aspects of the show aren't especially nuanced, they do give a distinguishing quality to what otherwise ultimately amounts to an average, if nicely-animated, high school drama. If you've read enough of my reviews, you've probably gleaned that I can sometimes get bored by ubiquity of high school as an anime setting. Thus, Classroom Crisis earned some goodwill from me by employing a somewhat unique concept, in tandem with its futuristic setting: a high school whose use of the students to build rockets somewhat resembles a pre-trade school track, but whose simultaneously employing these students to design and research the rockets adds another twist by bridging the oft-present gap between those who draw the blueprints and those who render them into reality. 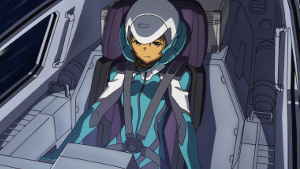 Like another futuristic series centered on a high school set in space, the atrocious Valvrave the Liberator, the series refers to these students as being "exceptionally" gifted, but unlike that show, which expected us to take this fact at face value, the degree to which we actually see the cast being involved in the science here speaks for itself, which is a nice touch. For once, even if the characters aren't especially interesting (which I'll get to in a minute), I at least found their ultra-competence believable, with the balance between this and their maturity level (being high schoolers) being fairly realistic. 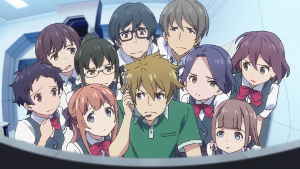 Now regarding A-TEC, the show both manages to make a decent political point and to shoot itself in the foot somewhat with this choice to have the students, who within the series are a unionized workforce, be both the engineers and the laborers. I say this because the main center of political conflict in Classroom Crisis is basically that between management, concerned mainly with the business end of things and the financial bottom line, and those involved in production and design; for a very simplified and Americanized perspective, perhaps consider how those in finance and management lean towards the GOP, long the "party of business," and workers, at least unionized ones, lean Democratic, with scientists and engineers increasingly heading that way as well (for a variety of reasons). Now, I'm not sure to what extent this applies to Japan, though it's worth noting that teachers and teachers' unions have been among the LDP's most consistent critics; however, the show misses an opportunity to look at how those who rally against a common opponent, in this case the management of Kirishina Corp., might still clash, as they usually do. And this does help drive home the fact that the politics of Classroom Crisis, while far more prominent than in most anime, are relatively simplistic. Kiryuu Nagisa, basically assigned to oversee A-TEC, is at odds with Sera Kaitou because the former views projects that the latter sees as indispensable as being uneconomical, to the point at which A-TEC's future is in jeopardy, and their conflict never progresses far beyond this premise. At one point, meanwhile, Kaitou and the students campaign in the hopes of a somewhat more labor-friendly political party gaining a majority in the assembly, with an inevitable "both parties are corrupt and not that different" argument being made at the end. The point is, it's a fairly simple setup with simplified explanations. This drives home the fact, I suppose, that the politics, which made me notice this show in the first place, ultimately don't dominate the outcome of Classroom Crisis. 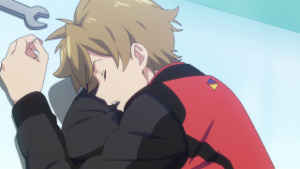 Indeed, the very first episode is a rather action-heavy sequence of the students using their rockets and technical know-how to solve a hostage crisis, and I'd definitely argue that the romantic subplot between Nagisa and Kaitou's sister, Mizuki, drives the plot far more than do the results of any election depicted in the series. Classroom Crisis does indeed make a handful of political arguments, one of the most effective being its satirizing the fact that if somebody from the scientists-and-workers end of things gains a seat at the management table, they've inherently become somewhat at odds with their initial base, and yet I'd argue that the show, at day's end, is mainly driven by pathos and emotional drama. Both Nagisa and Kaitou are sympathetic figures, in the end, and the show is fairly even-handed in its criticizing both management for having a poor understanding of what's happening on the ground floor and the union bosses for pretending to be less self-interested than they are: the real "bad guys" ultimately turn out to be Nagisa's adoptive family, and the mutual hatred between them stems more from the rather convoluted circumstances of his birth (it's frankly hard to follow) than anything policy or style-related. In other words, Classroom Crisis might most accurately be described as a high school drama with a sci-fi setting and political elements. 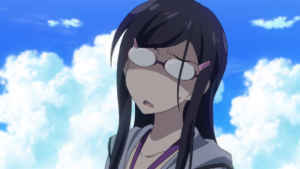 The italicized aspects keep it interesting, but it's still beholden to the conventions of its genre, with a prominent love triangle between Mizuki, Nagisa, and the Yuki Nagato-esque Shirasaki Iris, whose "mysterious past" dominates the runtime of several later episodes, and a megalomaniac big baddie of questionable mental stability, which the main cast spends the last few episodes taking down. 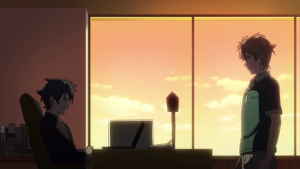 This is not to say that the show is bad, not at all, for it's quite nice-looking and well-animated, and the characters, while generally not very deep, are at least pleasant by-and-large, although the show's depiction of Mizuki's über-competent office-lady assistant Angelina as being short-tempered, childish, and short-sighted struck me as potentially misogynistic. Indeed, Mizuki's cheerfulness and Iris's expression-light and taciturn demeanor don't have much nuance to them, and yet I'll take their being bland but largely pleasant characters over their being unpleasant in addition to being bland. Kaitou makes for a likable if, again, somewhat one-dimensional lead via his strength of resolve in the fact of what are, actually, fairly realistically composed obstacles; he's basically left to deal with the fact that pedantic budget conflicts have the potential to derail even something as romantic as rocket-building, and even if his character doesn't do a whole lot else, it at least makes him sympathetic. So it's not exactly a bad show, simply an average one. 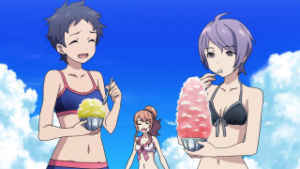 So over the course of this review, I've gone from making some observations about the relative paucity of politics (or at least overt discussion of politics) in anime to talking about the likability of the characters in Classroom Crisis, and I hope that at least somewhat demonstrates my point. This show, I think, is worth a watch because its setting and the relative prominence of serious politics distinguish it from other pleasant but unmemorable high school dramas; the bottom line, though, is that the pathos-driven drama ultimately takes over. It amounts to this show being of take-it-or-leave-it quality, I suppose, one that I don't at all regret watching but one whose staying power is, sadly, a bit less than I might've once hoped. Recommended Audience: Classroom Crisis is generally tame; there's little fanservice to speak of, and the depictions of violence are brief and not especially graphic, although one character's backstory is laden with emotional abuse. Should be fine for older kids and up.